Ald. Eleanor Revelle (7th) speaks at a city meeting. 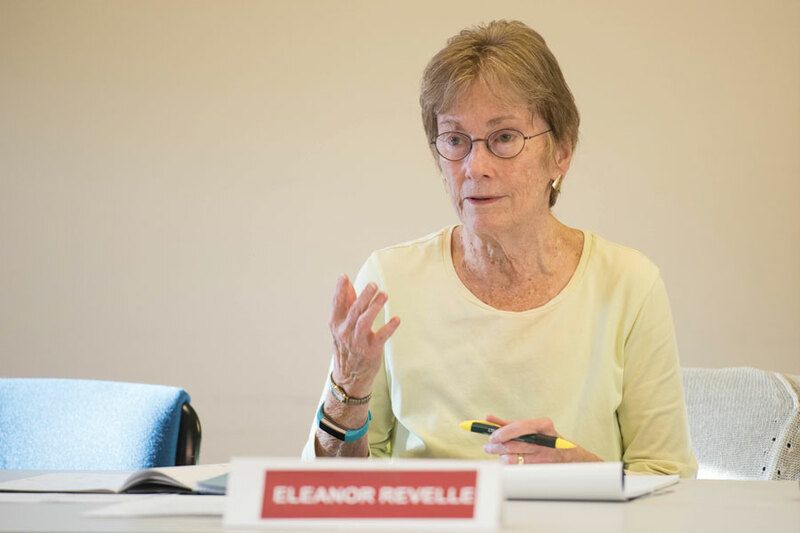 Revelle and other Evanston residents advocated against a proposed access road that would have cut through Isabella Woods in northwest Evanston. The board of the Metropolitan Water Reclamation District of Greater Chicago voted unanimously Thursday to block the construction of a roadway through Isabella Woods, an undisturbed oak forest in northwest Evanston. Isabella Woods is located north of Isabella Road and is currently leased to the city by the MWRD. The oak forest sits on clay soil and is part of the North Shore Channel, a wildlife corridor. Clay soil assists in stormwater drainage, making Isabella Woods a natural drainage site, said Libby Hill, the Evanston North Shore Bird Club program chair. Shad added it was very heartening to see the unanimous support from MWRD commissioners for a natural habitat in Evanston. Ald. Eleanor Revelle (7th), who attended the Thursday meeting, said about 15 Evanston residents came to speak. She said they urged the commissioners to decline the request for the easement during public comment. Evanston residents and environmental advocacy groups have spoken out against the access road over the past weeks, emphasizing the potential loss of valuable bird and wildlife habitats, as well as stormwater drainage. Shad said she sent out a letter that received more than 300 signatures and was seen by the Evanston City Council before its Monday meeting. Aldermen in Evanston voted Monday to reject the roadway and send the resolution to MWRD for consideration. The Cook County Department of Transportation and Highways asked the MWRD in April to build a road through the woods for the Keefe Family Trust, which sought to develop a series of residential homes on the vacant land, according to city documents. The department requested a 75-year lease on the property on April 28 to build the road. The portion of Isabella Woods that would have been affected by the easement contains 55 trees in an undisturbed forest, which provides a habitat for birds and other wildlife, according to city documents. A tree survey by city staff determined that for the road to be constructed, 33 trees would need to have been removed, and an additional 15 adjacent trees may have died. Now that the request has been denied, Revelle said the Keefe family could seek an agreement with Wilmette and try to build the road at a different point — like by the CTA tracks. Wendy Pollock, co-chair of Evanston’s Environment Board, said she was unable to attend the MWRD meeting but was happy with the outcome.